Sq Ft: 3,500 sq. ft. Ocean Front two story Villa for sale in Palacio del Mar, with over 3,500 sq feet of livable space. The pictures on this presentation are of a villa that has already been sold. The villa for sale is # 6 and it is offered at this price unfurnished and without the swimming pool and Jacuzzi. The pool and Jacuzzi package can be added for $35,000 dlls. A furniture package can be bought separately as well. 3 or 4 bedroom available floor plan. On the main floor, there is a two car garage, a grand foyer entrance, one specious oceanfront bedroom with a full bath and a walk in closet, and the ocean view living, dining and kitchen open spaces and a powder room. Laundry area is behind the kitchen. (A second laundry area can be accommodated on the second floor). On the second floor, the oceanfront master bedroom, a media room and another ocean front guest bedroom; or you can add the space from the media room to your master, to make it an amazing, oversized room, with a huge walk in closet. All bedrooms in this home have a bath within. On the second floor, both of the bedrooms have access to a large terrace that wraps around, with incredible views of the pacific ocean. Built with top quality materials, Palacio del Mar offers travertine throughout flooring, (full slabs on the staircases) high ceilings, double sinks in master. Top of the line appliances, full slab granite top counters and full backsplash in kitchen and many more upscale finishes. Palacio del Mar offers resort luxury living at an affordable price. First class amenities and services and breathtaking views. 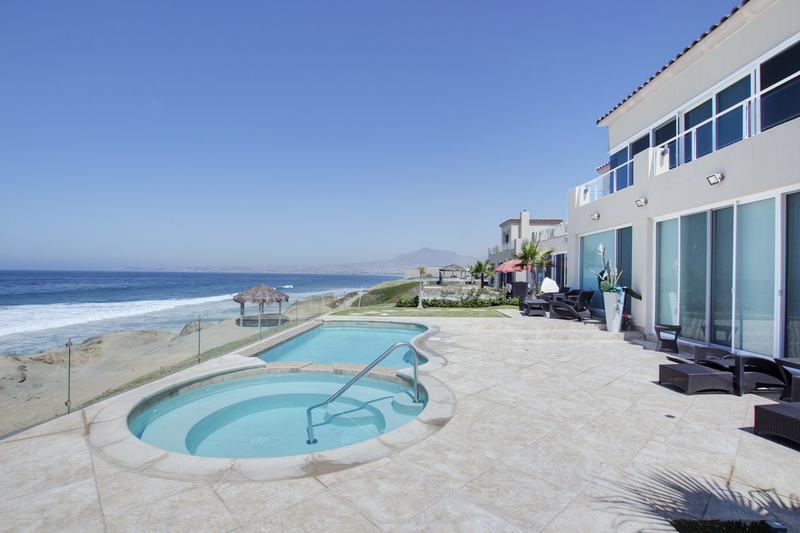 Palacio del Mar features luxurious two & three bedroom condos & villas overlooking the Pacific Ocean. Delivery of your choice villa is only 3 months. Make an appointment today to see the model home. Pictures of model home displayed. All bedrooms face the ocean to offer incredible views. All bedrooms have a bath within. Travertine floors, travertine slabs on staircase. Full slab granite counters in kitchen including a full backsplash. Top of the line appliances including washer and dryer, refrigerator, stove, oven, microwave, dishwasher. Private swimming pool available at additional cost. Beautifully designed floor plan, tons of natural light, high ceilings, large sliding door windows. Palacio del Mar is located next to Mision Viejo and the Sand dunes. Near the Primo Tapia Village, which offers small stores, restaurant and services. 360 virtual tours coming up soon. The pictures on this presentation are from the model home. The price advertised is for the new villas, completely finished and unfurnished. Swimming pool and Jacuzzi not included in the price. Square Feet: 3,500 sq. ft. Previous ListingCondo 804 – 3 bedroom, 3 bath / 8th floor South-end UnitNext ListingPenthouse 1902 – 2 bedroom, 2 bath / 19th floor, middle unit.